On American Tax Day, 15 April, it seems fitting to remember a time 800 years ago when tax strategies began to shift towards sales and property taxes. Enjoy! North-by-North-west of Toulouse, the Lot and Dordogne departments are a joy to behold: well-preserved medieval towns called Bastides with their neat churches, gridiron layouts and square covered markets cling to the limestone banks of the rivers for which the regions are named. One of life’s pleasures in this region is to sit comfortably in a café in the shade of a Bastide’s covered market on a summer’s day, enjoying a glass of the local Cahors wine. What the tour guides fail to mention is that these picture-perfect villages are the result of 13th and 14th century global economic forces, shifting tax strategies, technological innovation and plain old real-estate speculation. The first clue to the commercial purpose of the Bastide is its layout – specifically, the location of the church. Elsewhere in France and other European countries, the church usually occupies a strong, central position. Often it has its own square, vying for attention with the market square. But in Bastides, the market occupies the center of the village, with the church pushed off to one side. In this photo of Belves in the Dordogne, you can see the church is on a side-street of the main market square. 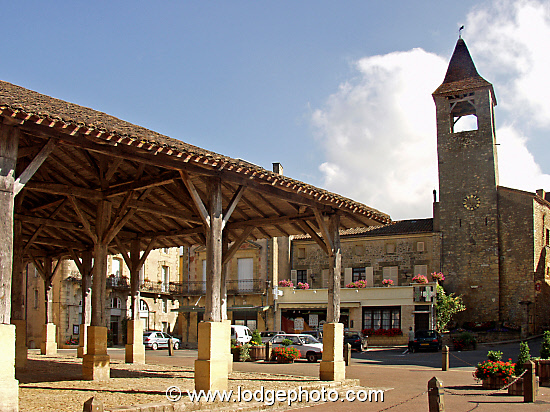 The covered market in the bastide town of Monpazier, Dordogne region, France. The second clue is that this central market square contains a large covered section – a fairly complicated structure, as you can see from all the exposed woodwork in the photograph of Monpazier to the left. Why go to all the trouble and expense of a covered marketplace? And then there is the grid-iron layout of a Bastide. To Americans, this may not seem remarkable since most American towns and cities are structured as a grid. In Western Europe, this is very unusual compared to the complicated twisting, turning streets typical of towns, villages and cities. All of this points to the fact that the marketplace – and by implication, trade – was important, but why? Also, why the division of the village into regular blocks? To find the answers to these questions, consider that the first Bastides were built in the 13th century, some time after 1229. This was a time of crusades, knights in armor and pitched battles fought by men in plate and chain mail, with swords and shields. We tend to think of medieval times as backward and simple. In fact, the 13thcentury was also a time of major economic change, as the importance of trade grew, and power exerted through the feudal system began to slip away. Beynac castle on the Dordogne river in France. This castle was on the front line of the 100 years war between France and Britain. In feudalism, the general population swore fealty to a lord. These vassals (literally, property) of the lord paid tithes - taxes - out of whatever they could produce. A lord kept law and order: police, judge and jury all in one, enforced by his private army. The army was led by knights - local gentry with allegiance to the lord. However, war technology had weakened the power of knights, to the point where they were becoming less decisive in battle. The development of the pike - essentially a long pointy stick - meant that foot soldiers could unseat charging knights very efficiently. A knight in plate armor knocked from his horse was lucky to be able to get up, never mind fight. Compounding the problem, the development of the bow - and in particular the English longbow - meant that archers could decimate a group of charging knights before they even reached the pikemen. This was bad news for the French lords, because without effective military protection, vassals resented tithes even more than they had before. At the same time, money was becoming a problem: French lords enjoyed a lavish lifestyle (for the time) and there had already been several expensive crusades to the holy land before 1229. Some years later, the 100 years war with England would begin, putting a further strain on finances. Farmers didn't make a lot of money, and mostly grew grain and raised enough cattle to live, with only a little left over. Lords needed another way to finance their lavish lifestyles, the crusades, plus whatever demands the church made. The lords needed a way to generate more money than the tithe system could produce. The Bastide was devised to solve this problem. The idea was to clear some land, build a fortified village and attract the local population to live there and work the land around it. If critical population density could be achieved (the speculative part), this would attract merchants to the markets, which could be taxed. The incentive for people to live in a Bastide was release from fealty to the lord, and exemption from tithes. Men who moved to a Bastide became free, yet still enjoyed the protection of the lord's army - the beginning of the end of feudalism. The lord could now make money through property taxes on those living in the Bastide, and also sales taxes on the town market. 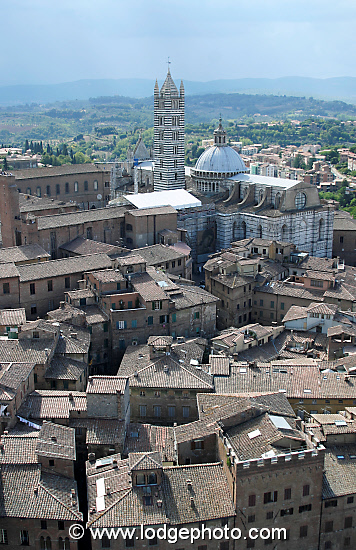 The market was the center of the town instead of the church because it generated sales taxes. The Bastide was laid out on a grid because that made assessing property taxes easier and more equitable. The laws of the Bastide said that trade could only take place in the market square, and the purpose of the covered area was to protect the weighing and measuring devices of the lord's representative and tax collector. Despite the ravages of the Hundred Years War, Bastides survived well, though many came close to demolition or "improvement" in the earth 20th century. They were saved by the recognition of the contribution that tourism made to the local economy. The glass of Cahors you drink in the cafe is not just a good bold, dark wine - it's also a way to preserve Bastides for future generations. How do I take vivid, colorful landscape photographs?